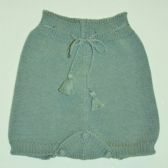 Fanny Belette is a luxurious french baby collection of refined and comfortable clothing inspired by times gone by. Designed in France, manufactured to high standards in Peru. All the clothes are handmade in Peru, and fair trade. The designs are created by Stéphanie Bellet, who spends a lot of her time travelling for several months a year in south America specifically to be inspired and develop her collections as well as oversee the production of her collections in Peru. The designer feels Peru has unique material production quality, and her clothing lines are made of organic pima cotton, mixed with silk, and baby alpaca. 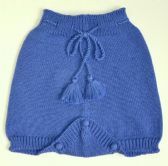 Throughout the range it is possible to see her love of knitting reflected in her clothing range. 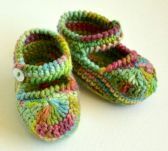 Cutchycoo offers you one of her Spring/Summer collections. Offering a large range across the entire collection, to allow our customers to mix and match. Cutchycoo also have a couple of exclusive designs, just for us. Bringing back some nostalgia in a luxurious form. Vibrant multicolour wrap around cardigan made with a cotton and silk blend, pure luxury for you baby. 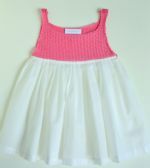 A pretty fawn and cream party dress, combining a stunning knit top half, with beautifully manufactured pleated dress.